The Fulledge area of town was still trying to come to terms with the murder of 73-year-old Kenneth Howard and in truth the police had few clues although they did confirm that Mr Howard's next door neighbours had suffered a burglary a week earlier. A 3" gold coloured powder compact had been stolen and police hoped that finding it could lead to the killer. Such was the lack of progress that a substantial reward was offered for evidence leading to the arrest and conviction of the killer. St. Peter's Church in Burnley had been closed for some renovation work. They'd hoped the doors would be open again ahead of Christmas but then received the news of a devastating blaze through the roof tower and nave. The visibly shaken Rector of St. Peter's, Cannon David Towers, was called from his bed and told reporters: "I think it took about an hour and a half to get the fire under control. It hasn't sunk in yet. It's been a very long haul to get this far and I'm sick at heart." The Rt Rev Ronald Milner, Bishop of Burnley, also rushed to the scene and he had nothing but praise for the firefighters, saying: "They worked extremely hard under difficult circumstances and although the damage is considerable, it would have been far greater had it extended into the chancel roof." Police were treating the fire as suspicious as further bad news came in that there had been smoke damage to the organ. "The whole history of Burnley has been tied to St. Peter's for 1,000 years," said local MP Peter Pike. There is always some good news to be found and it came in this week from a lady who found a camera in the Duke Bar area. Some might have taken it home celebrating such a find but this lady had the film developed and then took the photographs to the Burnley Express to help find the owner. She paid for the film processing out of her own pocket and the local newspaper thanked the lady for her efforts in trying to locate the owner. They were only too pleased to print one of the photographs. One young couple were enjoying themselves and as they walked down a Burnley street holding hands they decided to sit on a house windowsill whilst having a kiss. The owner of the house wasn't too impressed and shouted through the window for them to clear off. Unfortunately they caught the window and broke it. That was it for the house owner who chased them down the street wielding a baseball bit which he used to hit the young man on the back of the head. That led to a court appearance but Judge Ian Webster warned him that he should not take the law into his own hands. He also told him that he appreciated that he'd been severely provoked and handed him a conditional discharge. A local bus was making its way to Worsthorne down Brownhill Road when it ploughed into a bus shelter. There were no passengers either waiting at the stop or on the bus at the time and thankfully the driver escaped unhurt. "Warning - why the £2 pint is in sight" - that was the heading of a petition Burnley folk were being asked to sign by members of the Burnley Licensed Victuallers Association. They were protesting at the increases in rent from the brewers, in some cases they'd been doubled, and over 1,500 local drinkers had already put pen to paper. A petition, and the town was also preparing itself for what was, according to organisers, going to be the biggest demonstration ever seen in the town. It was being organised by anti-poll tax protesters in a bid to stop the jailings for non-payment. In local cricket the season ended with both of the town's Lancashire League clubs winning by six wickets. Former Claret Leighton James scored 23 for Burnley in their win over Colne whilst Lowerhouse's win against Nelson owed much to substitute professional David Capel from Northants. he took 5/40 with the ball before making 78 with the bat. The cricket might have ended well, but the football had taken a downturn and Burnley weren't able to get back to winning after suffering that defeat at Hereford seven days earlier. It was crisis time ahead of the game for manager Frank Casper. The shock news was that Steve Harper, who had been playing at left back, had broken his arm in training. He'd had a manipulative operation and would be out for four weeks because of his arm being in plaster. David Hamilton was suspended for one game following his red card against Crewe, but in any case he'd been stretchered off at Hereford with a ricked back and would not be fit. Neither would Ian Measham, who'd been out since the Aldershot game with a knee injury, but it was hoped that all of Andy Marriott, John Deary, John Francis and Mike Conroy would play despite none of them being fully fit. Casper said ahead of the game: "Rochdale have started well and are a well organised team and being near the top gives them a lift. My players have got to put Saturday's disappointment behind them and get on and do the job against them. We have got to pull out all the stops and get a result because no one wants to lose too much ground on the leaders." Rochdale arrived unbeaten, and disappointingly they returned to Spotland with that record intact after beating Burnley 1-0. 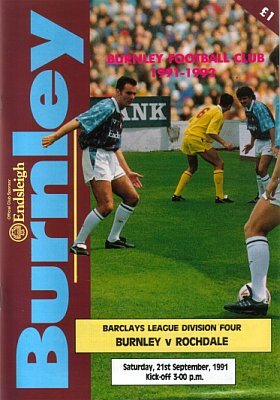 It was Burnley's first home defeat of the season, the same number as had been lost at Turf Moor in the whole of the previous 1990/91 season. Despite the boost of some of the injured players being available, there was more bad news ahead of kick off with Steve Davis ruled out with illness and that saw Jason Hardy drafted into the side as a sweeper. 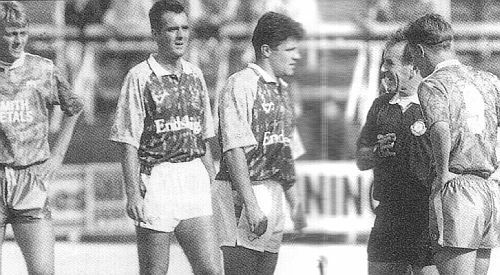 We had twelve players on the pitch too, with goalkeeper David Williams being allowed to play against us for Rochdale whilst on loan with them. Burnley came up against a very big, strong, physical Rochdale side and had two very good penalty shouts in the first two minutes of the game. Almost from the kick off, in the first attack, Francis went down under a challenge from Tony Brown only for referee Ian Hendrick to wave claims away. A minute later Conroy was thrown to the floor by Steve Whitehall with Hendrick incredibly still not interested. It had been good start from which we should have been given a couple of opportunities to go in front, but we continued to dominate and were much the better side in the first half hour. When we did get past the big defenders though we found our own goalkeeper in outstanding form and more than once he kept his loan club in the game. The second half followed the same pattern with Burnley having most of the play, but we were nowhere near our best and struggled against their defensive approach. The one saving grace was that they were creating nothing. That was until just over 20 minutes from the end. Mark Monington conceded a corner under pressure from Whitehall. Andy Farrell failed to clear the flag kick and the ball dropped kindly for Andy MILNER who shot under Marriott for what proved to be the only goal of the game. Williams again continued to deny Burnley and when the final whistle blew it was 'Dale who were going home with all the points. It had been a very disappointing performance from Burnley, even accepting the fact that we were under strength. Harper had certainly been missed down the left hand side. He'd been providing so much for us attack wise and without him it seemed there was a real spark missing. The result saw us drop to tenth in the league with a visit to struggling Scarborough to come the week after. 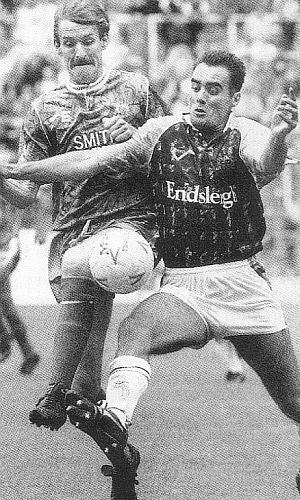 Burnley: Andy Marriott, Andy Farrell, Ian Bray (Roger Eli 53), Jason Hardy, John Pender, Mark Monington, Mark Yates (Danny Sonner 75), John Deary, John Francis, Mike Conroy, Joe Jakub. Rochdale: David Williams, Steve Whitehall, John Ryan, Tony Brown, Alan Reeves, Alex Jones, Jimmy Graham, Andy Milner, John Bowden, Mark Payne (John Halpin 54). Sub not used: Paul Butler. It was three wins out of three on the road for Rochdale and they were one of three teams on 17 points at the top of the league. Above them were leaders Blackpool and Barnet, the league's leading goalscorers with 21. Doncaster remained at the bottom, two points behind Carlisle, Scarborough and Maidstone.